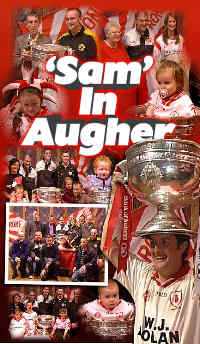 “Sam’s�?Tour of Tyrone, stops off in Augher on 29th October 2003. Hundreds of admiring fans turn up to greet Mickey Harte, Eoin Mulligan, John Devine and Enda Mc Ginley as they continue the All-Ireland winning celebrations. Running Time 80 mins approx.